to propel your player through an adventure. This is as easy has hopping on Amazon. Most small lights are no more than $40. I like using this one because it shines very brightly, fits in small chests, and has an easy to figure out button (you might be surprised how confused some people can get when given the flashlight). When it comes to blacklight pens, you definitely want to check the reviews. Depending on what type of paper you write on, some ink shows up much clearer under the light but you also run the risk of having it show up when the paper is held at a certain angle. When deciding on thy type of pens to use, factor in the type of paper, and also how bright the location your player will be in when they use it (if they are in the middle of the park in a sunny day, it’ll be harder to read. if they’re in a small nook in a dark library, it’ll be easier. You give them an envelope when they start the adventure, halfway through, they receive a black light, shine it on the light, and voila! There is an new message to propel them to the next location! Give your player a few cards with a task on each. The task can be as easy as answering a riddle on each line or walking through a town square and looking for landmarks (i.e: whats the name of the statue next to the large fountain. Once they fill in the blanks, they can head to another location and find the blacklight. They shine the blacklight on the cards and certain letters are underlined! This not only gives them a bit of a challenge but also a reward for completing a task! Let’s talk about a few places that already have backlights built in. In this instance, you don’t even need to dead drop anything. When researching locations, it’s worth noting that almost all laser tag arenas have black lights. The staging area (where they give instructions) is usually ONLY lit with backlights so everything will show up clearly. You can also rely on bowling alleys when they have cosmic bowling. Finally, I’ve run into a few fun bars like Kilowatt in Ocean Beach. 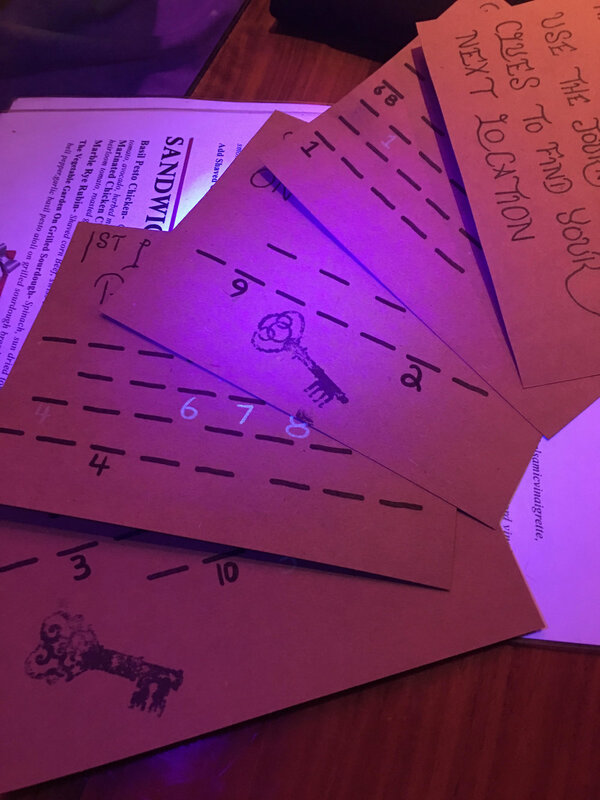 For my last grand hunt, teams opened their map under one of the back lights to reveal a riddle! It should go without saying that you should TEST everything before hand. You might find that some ink isn’t as strong or that the area is too brightly lit. Let me know if you know of some other great places with backlights or if you use them in another creative way!